LC-2 Lambda Cable (Standalone Wideband Controller) with wideband 02 Sensor and our famous Billet round 2-1/16" display in a stand alone package deal. Comes with everything you need even the weld on bung. WideBand Round Display for innovate Controllers. This gauge will display the air fuel ratio from the wideband innovate controller LM-2 and LC-2 models. Air/Fuel Ratio Gauges help you tune for maximum performance. These extremly accurate gauges are simple to install and they work with your existing Oxygen Sensor! Available in Red, blue or Green Displays. 100% billet aluminum. 2-1/16" round. Digital Fuel Pressure Gauges with electronic sending unit. No more running Fuel lines all over your vehicle! 0 to 150 PSI great for supercharger, turbos and Nitrous use! Available in RED, Blue or Green Displays. 100% billet!! 2-1/16" round. Digital Boost Pressure Gauges are super accurate compact. To 150 PSI boost and they even read vacuum! Available in Red, Blue or Green Displays. 100% billet aluminum! 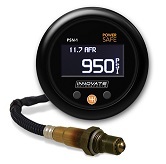 Digital Nitrous Pressure Gauges with electronic sending unit. No more running nitrous lines all over the interior of your vehicle! Available in Red, Blue or Green Displays. 100% billet aluminum!! Dual gauge, nitrous pressure, wideband and lean shut-off, window switch etc..
Digital Exhaust Gas Temperature Gauge Including the probe! Compact, accurate and fast responding. Available in Red, Blue or Green Displays. 100% billet aluminum!! This Billet aluminum Nitrous switch center will simplify all your switching needs.... These units are show quality! Another DynoTune original. Bosch Oxygen Sensor Bosch LSU4.2 5-wire, wide-band O2 sensor for dynotune and innovate controllers. Many other wideband systems use this same sensor. 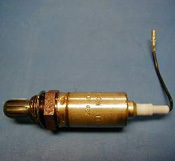 One Wire Bosch Oxygen Sensor. Liquid Filled Nitrous Pressure Gauge 1.5" with black or White face and chrome bezel. Mount this show quality gauge on your bottle so you can keep an eye on that bottle pressure.